I’ve had at least 50 variations of this conversation over the last month, ever since I was given the long, round key to the above model vehicle and asked if I wanted to let ‘er loose on the on the streets of the Big Apple. Now, I don’t have any kids (as far as I know) so driving “the van” was a bit of an odd concept to me at first. Thankfully, it hasn’t been difficult to navigate and it’s nice to be noticed by New Yorkers, instead of just having them dart out in front of me at all hours of the night. Eventually, the topic that always arose during this exchange was about the new model of Taxi. Was there really a citywide competition? Would it be ADA compliant? 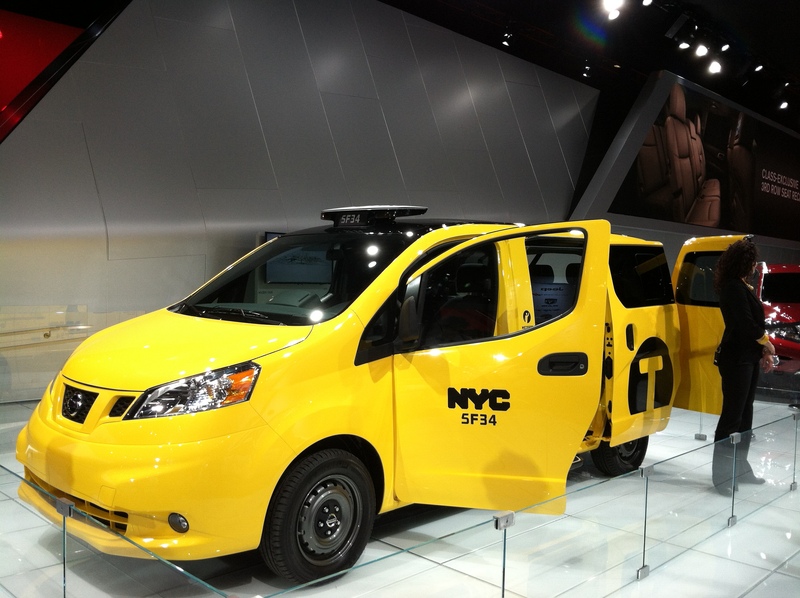 Most importantly, would there be a day where *all* the yellow cabs in the citywide fleet would be identical? Yes, yes, and if the TLC gets its way, yes. They were lousy on gas. I drove a Mustang for years, so I’ll admit that I have a bias for the automaker that started out making mobility available for the masses. It had a big engine and wasn’t the best on fuel economy but I didn’t spent a majority of my time on thoroughfares that could double as logging trail pathways. Eventually, the price of gas spiked up and greenies became powerful enough to change the vehicles found in Taxi fleets. 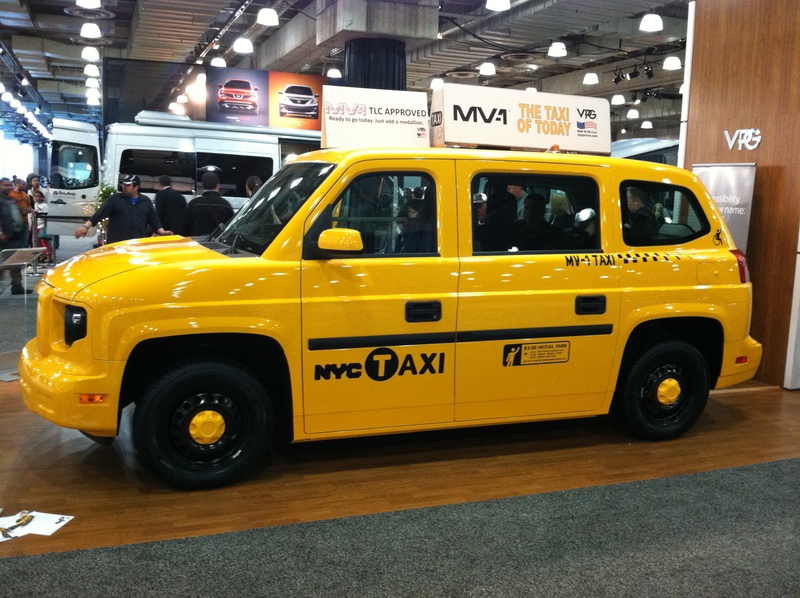 Of course, that was out the window once competition entered the Taxi marketplace. While I don’t buy and sell medallions like owners do, drivers like me *are* the public face of the industry so when I’m on duty, I see enough to know what works and what doesn’t. Ladies and gentleman, this is it – your Taxi of Tomorrow. It was tucked way into the corner of the exhibition space and was only found by me since as usual, yellow wasn’t a popular choice of exterior colors on next year’s models. You’ll also notice the glass around the edges, so I wasn’t able to sit inside of ‘er and see how well it felt for the person who might actually have to drive it. Once the initial amazement wore off, it was time to give this model a good inspection. Press releases for the vehicle touted its accessibility, large sunroof-like window for sightseeing landmarks around the city, and recycled tires used in the floor mats. As a sign of the times, it has USB ports for charging electrical devices too and a built-in GPS and meter which does show some input from the driver’s perspective. A few shots of the promo video that accompanied the vehicle featured it in locales such as Times Square, seamlessly fitting in with the traffic and neighborhoods that it will inevitably have to pick up and discharge passengers in. While models and renderings are always pleasing, the Taxi will be just like me when it finally comes down to hard labor and brass tacks since real test will come once the key is turned and the grind of 12-hour shifts takes its toll. 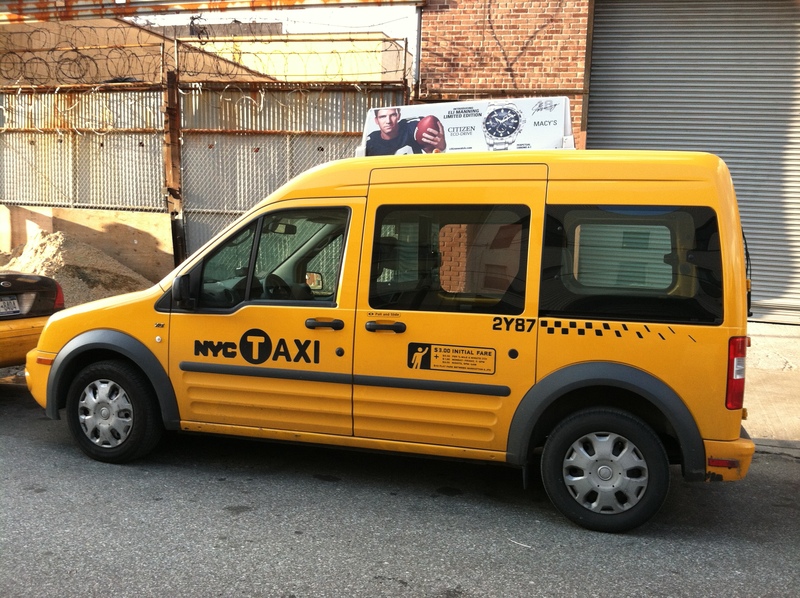 Nearly every model of cab has its drawbacks from what I’ve experienced firsthand. The Crown Vic is a fuel hog and has a turning radius the size of a 747. The Prius? I’ve seen a few at JFK take two pieces of luggage before the passengers took them out and found a cab that was up for the task of transporting international arrivals home without feeling like a sardine can. The SUVs? Guess what – they’re small on room too, once they carry 4 people. Hybrids are great too but God forbid you’re deaf or blind – you’ll be next to one and have no idea that it’s actually moving until you find it or it finds you. Oh, and that Transit Connect pictured way at the top? The one I drove two Saturdays ago had to go in for brake service halfway through my shift, and it had an astounding 14,000 miles on it. Thank God I don’t have to explain this to my passengers…yet.